Optimai DCI Pricer is an effective sales tool for your sales team. 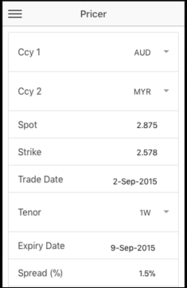 This mobile web application supports DCI placement, maturity handling, as well as commentaries and trade ideas. For DCI placement, your sales team will be able to select a currency pair and indicate a spread. The DCI Pricer will then pull real-time spot price from your market data vendor (such as Bloomberg), compute customer yield, autogenerate and email DCI Term Sheet & Confirmation Note to your customers. For DCI maturity handling, your sales term will be able to see a list of DCIs that are maturing. Sales can use the DCI Pricer to follow up with clients and take in clients’ maturity instructions such as rollover, invest in new DCI, move to Trust account, etc. The DCI Pricer will also enable your Treasury Team to post commentaries and trade ideas. This will make it easy for your Sales Team to review and share these ideas with your clients. Optimai DCI Pricer supports configurable workflow, configurable email alerts and may be interfaced to external systems. For instance, we can configure the DCI Pricer to route trades to your treasury team for confirmation before generating DCI Term Sheet and Confirmation Note. 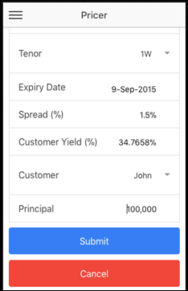 Similarly, we can configure the DCI Pricer to generate alerts to your Treasury Team when there are trades pending their actions. We are also to interface the DCI Pricer to external systems such as market data vendor or back office systems. The DCI Pricer may be extended to include other Treasury products such as Exchange Linked Investment (ELI) Pricer.